Since Fender took its original Deluxe amplifier and adorned it in tweed, the much coveted cabinet has made its way onto some of the world’s greatest guitar tracks. The Deluxe is the original Fender amplifier - the Model 26 ‘Woody’ Deluxe dates back all the way to 1946, however, it’s the tweed-covered versions made between 1948-60 that have become the most coveted. 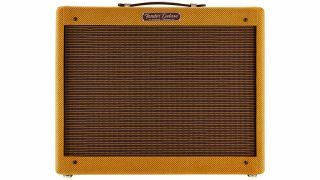 As with many Fender amps, the Deluxe circuit went through several iterations before arriving at the legendary ‘narrow panel’ 5E3 version. A pair of cathode-biased 6V6 output valves with no negative feedback gave the Deluxe a complex and highly-responsive overdrive when pushed hard, with an edgy bite that decays into a rich, smooth mid-biased sustain. The Deluxe has a simple control panel, with two pairs of inputs feeding a microphone and instrument channel, with separate volume controls and a single shared tone control. A compact pine cabinet and a single Jensen P12R made the Deluxe easy to carry and it made its way onto many bandstands, playing all kinds of music from blues to western swing. It’s a peculiar quirk of the Deluxe circuit that all three controls interact with each other all the time, even if only one input is in use, so there’s nothing to be gained by jumpering the two channels. Over the years, the Deluxe’s rich overdrive and moderate volume output have made it a perfect recording tool; some of the world’s greatest guitar tracks have been recorded with it, from Royal Scam-era Larry Carlton, to Billy Gibbons, Joe Walsh and Neil Young, so it’s no surprise the tweed Deluxe is considered one of the most infl uential amps and a favourite for digital amp modellers. The ‘TV’ fronted tweed 5A3 Deluxe made its debut in 1948 and lasted until around 1953, when it was replaced by the ‘wide panel’ cabinet, which lasted for the 5B3, 5C3 and 5D3 circuit updates replaced with the most desirable 5E3 ‘narrow panel’ design in 1955. The narrow panel tweed Deluxe stayed in the catalogue for the next five years and was finally replaced with the 6G3 brown Tolex angled front control panel design, in around 1961. The 5E3 Deluxe uses a 12AY7 and half of a 12AX7 in its preamp, to drive a pair of cathode-biased 6V6 power valves. A 5Y3 rectifier valve provides the DC volts, producing a total output of around 12 watts. Originally developed for use in car radios, the 6V6 is a beam tetrode power valve and it is often thought of as a mini 6L6. Both valves have history as they were first introduced as far back as 1936. The tweed Deluxe’s chrome control panel and chicken head pointer knobs are part of one of the most-copied amp styles ever. Two pairs of high and low gain input jacks feed an instrument channel and a flatter response microphone channel, with separate volume controls and a shared tone control. Despite the simple layout there’s a wide range of tones that will suit most guitars. Getting that edgy blues-rock tone is as much about attitude as amp settings. A good humbucking guitar with a PAF-style bridge pickup will get you in the right tonal ballpark. One trick that works is to dial in more gain than you need and back off the guitar’s volume control for normal playing, pushing it up when you need extra emphasis and sustain. Plug in a decent single-coil guitar - ideally a Tele, with the tone control backed off to achieve a nice round sound with not too much bite. This setup is ideal for recreating 50s and 60s western swing, though blues and into rockabilly, if you get the pickup tone right it can be very authentic. During his time with Steely Dan, Larry Carlton contributed some of guitardom’s most copied solos and emulated tones, helping to defi ne the sound of 70s AOR guitar. Most of those towering solo parts were played on Carlton’s trademark ES335 into a wide panel Fender tweed Deluxe, tweaked so Carlton could use playing dynamics to control the amp’s attack.